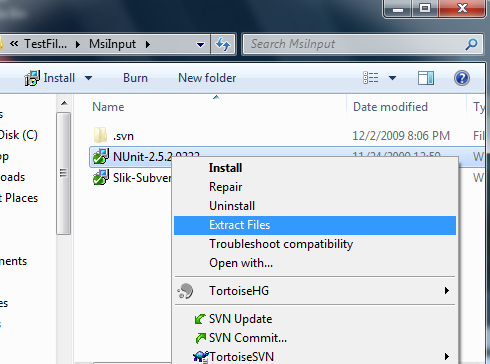 Opens the specified msi_name in the GUI. Extracts from the specified archive. 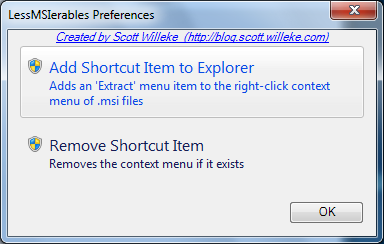 path_to_extract: (optional) The path to extract the files to. MUST have trailing backslash or it will be treated as one of the file_names. file_names: (optional) Names of files that you want to extract from the msi. All files are extracted if not specified. Note: There is a known bug err "limitation" that you can only specify the name of the file (not the path). Therefore if there are multiple instances of the file inside the msi with the same name and you want to extract that file there is no way to specify which file to extract. If this is a problem for you report an issue and if I know it is important to someone I'll take the time to make that work. Note: /x will work as the "command" for backward compatibility. The /x command is obsolete. It may be removed in the future! Extracts a.txt and b.txt from c:\theinstall.msi into the directory c:\theinstallextracted. Lists the specified file table as a csv. 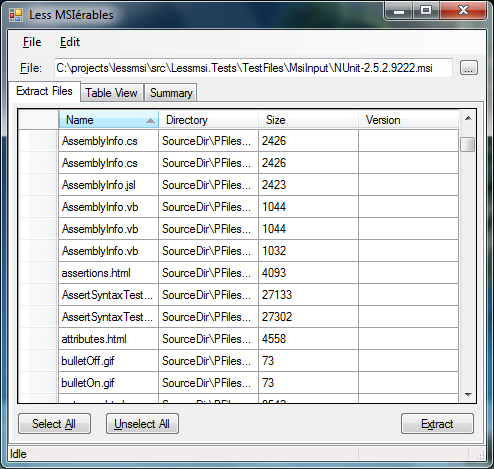 -t (required): Switch to specify which MSI table to extract. msi_name: (required) The name of the msi to open extract the table from. Prints out the msi version. msi_name: (required) The name of the msi to display the version from. In addition to allowing you to extract files from the command line and from inside Windows Explorer, lessmsi has a graphical user interface that allows you to view detailed information about any MSI file. 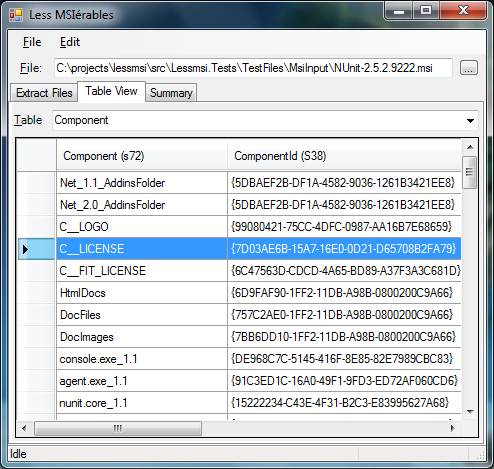 Windows Installer (.msi files) are based on an internal database of tables. Lessmsi features a viewer for those tables. Useful for people who work a lot with installers. 343 594 Scott Willeke <img src="https://www.oldergeeks.com/downloads/gallery/thumbs/lessmsi3_th.png"border="0"> Nov 26, 2018 - 12:14 1.6.3 496.7KB ZIP , out of 2 Votes.